Marcia Ford is hilarious. Reminds me of writer and librarian, Marge Wood, who has written for Wineskins. Ford is giddy about the fact that independent voters have become a major political force, from around 10 percent in the 80s to more than 40 percent today. This is a great development because it loosens the bounds to red and blue parties. She says, "The growing discomfort with the church&apos;s alignment with the Republican Party, coupled with a refreshing freedom to question the authority of our old-guard leaders, has awakened many evangelicals to the ramifications of that lockstep obedience. Ford has mentioned Jim Wallis by page 17, showing once again Wallis&apos;s enormous influence in the past two decades that has ballooned since 2004. 1. We&apos;re tired of two self-serving, self-promoting parties. 2. We are fine with voting for someone with no chance of winning. 3. We vote for the person not the party. 4. No chance we&apos;ll vote a straight party ticket. 5. We have decided to be independent; don&apos;t call us undecided. 6. Diverse opinions stimulates good debate. 7. And two major parties suppress this healthy debate. 8. We want government following the will of people, not manipulating it. 9. We want Ralph Nader to keep on running and keep on fighting and keep on debating, even if we don&apos;t vote for him. We probably need to apologize for that. 10. We&apos;re inconsistent, antiparty, and yet we welcome third-party voters and candidates to join us. No, not inconsistent but outsiders and we want other outsiders to join us–there, that&apos;s better. 11. We thank God for the internet. Atheists among us might thank Al Gore. 12. We believe the United States is better than this. It’s not easy being Purple. Having to spend each day the color of Republican and Democrats. When I think it would be nicer being red, or blue, or green, or something more primary like that. But purple’s the color of a lavender field, or the color of the sunset kissing the clear blue sky. And purple can be big like a MOUNTAIN’s Majesty, or bold, like a river, or small like a flower. I’m purple, and I think it’s what I want to be. Thanks to Bruce and Valerie Judd, I am at the Get Motivated Seminar at the new BoK Center in downtown Tulsa. I parked at Memorial Bus Station and rode the bus, which drops off at the Denver Station across the stree from the BoK. Traffic, they say, was awful this morning and likely will be again at rush hour. Colin Powell was great and my favorite story was his last about a hot dog vendor on Park Avenue in New York City where he gets his hot dog and mustard and red onions and the guy recognizes him and says he doesn’t have to pay. The hot dog vendor is a recent immigrant and says Powell and U.S. leadership already paid him for the chance to come to America and make a living and have a future. Immigration is a big issue in this campaign, though I haven’t heard much talk about it so far. I’ll be listening particularly in the first debate on foreign policy, because the two are related. Joe Montana I think is coming up soon, so I better get back. 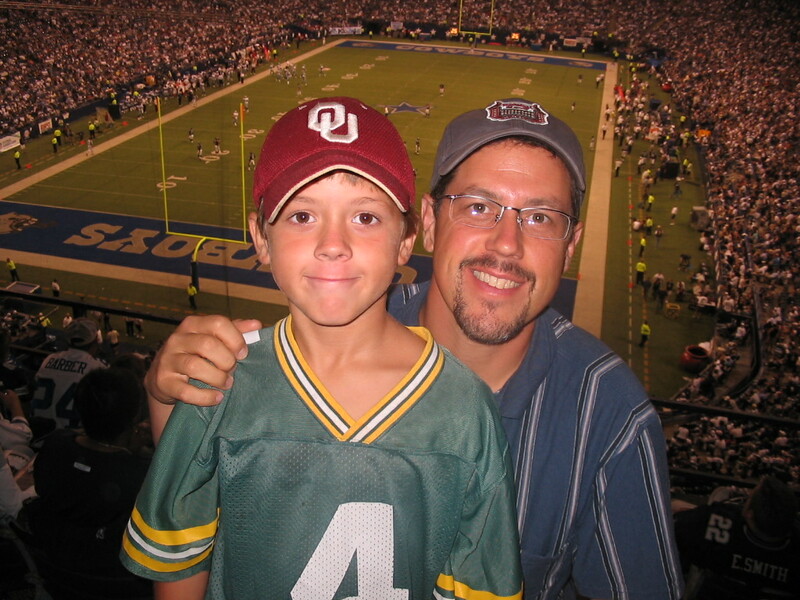 My son, Jacob, and I went with our good friends, Chris and Eli King, to the Dallas vs. Philly MNF game. My good friend Chris King said he was thinking about going to the MNF Cowboys vs. Eagles game. We were standing around before our sons started their flag football game Saturday. We left promising each other we’d look at tickets online and report back. I forgot the promise. Chris, on the other hand, scoured online, found tickets at the Cowboys season ticket holder exchange. I told Jacob “You’ll never forget this one because it was your first, and an incredible one to start with!” Maybe he’ll see some better defensive games in the future, but for all the excitement of MNF, that was a rare treasure and great memory for all of us. Thanks, Kristen, for letting us drive the Tahoe and thanks, Chris, for arranging everything. Chris is a great friend, brother in Christ, and fellow minister. He is youth pastor at Liberty Church in Broken Arrow. In the days following 9-11, the nightmare continued, even in our sleep. Some dreamed of towers falling again and again. I dreamed about the firefighters going up when others were coming down. About September 14 I began searching for an artist to paint a piece that would become Wineskins cover art for the Nov-Dec 2001 issue. Artist Arden von Haeger and I began meeting, talking about what we as a collective were experiencing and what I was envisioning and the nightmare of 9-11. He sketched several pieces, and this is what he polished and we developed into the cover of the “9-11” issue. We completely changed what we were going to do for that issue. Can’t even remember what the plan was, but I think we just bumped everything up a notch. We also have some posters of this that we’ve donated to firefighters and for fundraisers. It is the art without the Wineskins masthead and without the titling superimposed. If you’d like to use this for fundraising purposes, or to give to a firefighter or firehouse, or just purchase a poster, email me. Met yesterday with 40 case workers and therapists at the East Tulsa Family & Children’s Services office. I was amazed and overwhelmed that this “army” of workers rolling back in after a long day of case work and counseling at schools. I told them how much I respect what they are doing, how ministry is done not at churches but in our lives, our jobs, our neighborhoods . . .
That’s why Jeff Krisman and I had come to meet with this group, hosted by the director, Whitney Downie. We were sharing with them about Neighborhood Kitchens, a place where people can come and share a meal and their heart. We’re a group of educators, government worker/volunteers, business people, representing a variety of faith communities who want to change the world . . . starting in East Tulsa. Each week we host a meal and invite our neighbors and so far each week we have 70-100 adults and children who are coming to eat and talk about how to make our community a better place to live–less crime, teen pregnancies, gangs, drugs and more life, healthy families, joy, and shalom. Jeff Krisman has a vision and he asked me and the Garnett Church of Christ to join him. We did. You can read more about it at www.neighborhoodkitchens.pbwiki.com. You’ll see at this link that we’re working with several community groups, including the East Tulsa Prevention Coalition and OU-Tulsa to develop the project. We asked the group at Family & Children’s to participate in the Neighborhood Kitchens project, help us assess where people are in need. Then I told them each day when I see my kids off to school I kiss their heads and whisper the priestly blessing of Numbers 6 over them. I said I wouldn’t be kissing any of them on the heads but would say the blessing over them and the tremendous and challenging work they do. I told them our church comes to the community with the humble realization that we can’t educate, fund, counsel, do all this group does and schools do and businesses do, but we can open ourselves up, be the church we are and share God’s love and partner with our community. Lenore Skenazy: "Mommy path to power: PTA"
The best article of the week goes to Lenore Skenazy on the PTA and Governor Palin. I read it to Jill and couldn’t get through it without her saying, “I’ve been to those meetings! They, yes–” OK, just let me read the article. I’ve actually been to a few of those meetings as well. Makes it even funnier. Great line at the end. This is political satire at its best. I get up and think about coffee. A short priestly blessing (Numbers 6) is usually spoken over the kissed heads of my children when we say goodbye. Other than that, I often don’t think of prayer till I get to the office, but it’s my goal each day to start with a time of prayer, and I don’t always start with it but get to a time of prayer at lunch or other time. I use a prayer guide edited and compiled by Phyllis Tickle called The Divine Hours, recommended to me by Wade Hodges (his practice personally, with our Garnett staff is the true power of the recommendation). In conversation with several Garnett Church of Christ partners Sunday, a common theme was that people need guidance in their spiritual journeys, with Bible reading, with prayer templates. For those in this boat, here’s a recommendation for family prayer: we use a very helpful prayer guide by David and Heather Kopp called Praying the Bible with Your Family. Whatever method of prayer, start your day with prayer, find times to pray during the day, and end your day with prayer. It’s hard sometimes for me to pray at night because I’m so tired when I hit the pillow, but Jill often asks us to pray, and sometimes we’ll pray about something specific or we’ll occasionally say the Lord’s Prayer together. The Lord’s Prayer is a constant in our church. We’ve been saying it together in each assembly for about two years now. Sometimes a few minutes of pure silence helps to acknowledge that the day is not about your activity but God’s work all around you, happening even as we are still. My brother said he tries to start each day with five minutes of silence. Lots of us are silent when we wake, but how focused is that silence on the reality of God and his presence? As I mentioned, that time when I wake is often filled with visions of coffee plums dancing in my head and a desire to get some reading or writing time before everyone else wakes up (not that I’m always first up–my kids and Jill are usually up pretty early too). Sarah Palin silenced a lot of people last night. Her speech was delivered like a pro, leaving critics of her lack of experience to at least acknowledge she not only holds her own on a national stage but excels at the art of inspiring a crowd and a television audience, perhaps a nation. I remain concerned not just about her lack of international experience but also her potentially more strident foreign policy slant. What I often hear from the Republican side about foreign policy sounds ethnocentric, going beyond patriotism to a nationalism that cares not how we interact with the world, so long as U.S. interests are served. I have as much problem with this stance, and the Bush doctrine of offensive attacks (as he repeated in his video speech two nights ago) as I do with the Democratic party view on abortion. The “going overboard” score is at least 1-1 with Obama’s cave comment and Palin’s reference to Obama’s concern for human rights in the war on terror (I think she was referring to a terrorist having rights read to them). Since I was voting age, I have been independent. I have tried with each election to truly make a choice between the candidates and not have a preconceived or party-picked vote. I don’t think this is the only way to go about your voting, of course. It’s just my way and I suppose hundreds of thousands of others do so. I don’t know the figures, but I suppose most voters are registered with a party. Even so, would you consider really considering the issues this year rather than just voting your party line? I’m open to listening this week to the RNC speeches, as I was open to hearing DNC speeches. This doesn’t mean I’m not subjective in much of the way I hear. Part of being more objective is realizing at least a few of our major biases. Though Rick Warren’s forum was roundly criticized by some, I’m proud of him as a Christian who was trying to be fair and have both candidates on the same stage, though not at the same time, and ask the same questions of each. What Warren is modeling for us is an allegiance to the kingdom of God first, not country and certainly not to party, neither Democrat, Republican, Libertarian nor any other.